Steven Butala: Welcome to the Land Academy Show, entertaining land investment talk, or at least we hope. I’m Steven Jack Butala. 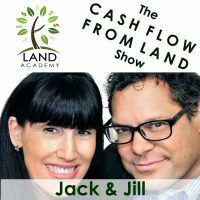 Steven Butala: Today, Jill and I talk about land orders online, taking your land orders online versus on the phone. Steven Butala: This is a spoiler alert. I’ll give you a spoiler alert. It is inefficient as hell to talk on the phone. Jill DeWit: Yes, this is true. Steven Butala: 90% of the time. Jill DeWit: We’re talking about business-related, not just dating, right? Steven Butala: No, I think that’s inefficient, too. Jill DeWit: I knew that. Steven Butala: Want to get down to business when you’re dating. Jill DeWit: Thank you. Less talking. Love it. I get it. Steven Butala: As she pins the microphone to her chest. Steven Butala: We just bought 20 of those this week. Go ahead. Steven Butala: Classic. Classic answer your own question at the end. I love it, Matt. You answered your own question. I love buying tax deeds, because they went through adverse possession for you for free. Jill DeWit: They did all the work. Steven Butala: When the county takes a property back for back taxes, they have to go through the same rules that we do for adverse possession. They have to find out if there’s anybody that has any interest in this property, any interest in stepping up, paying the taxes, and taking the property over, in Arizona anyway, including going through the whole seven-year tax lien process. By the time you get a tax deed, it’s pretty darn clear, almost without exception, almost without exception, that nobody has a real interest in the property. Usually they’re just not alive, that’s the real truth of it. Steven Butala: Should you be concerned? No way. Jill and I built a whole company a long time ago on tax deeds just like this, and tax liens. And subsequently found out it’s way more efficient and faster to buy property from people. Jill DeWit: Can I add one little item? That what you need to do when you convey the property, because I did this the very first time, years ago. I was so ingrained in my head to copy the deed from before, just mirror it all, change the grantor-grantee, right? Legal’s the same, everything they have on there’s the same, just copy that over. I went out and made my own treasurer’s deed. Steven Butala: Did you really? Jill DeWit: I did. Do you remember? You don’t remember this? Jill DeWit: I came to you and I said … For signing it. Steven Butala: This is hilarious. Steven Butala: I said that? Jill DeWit: You did. I’m like, “I don’t know what you’re talking about. I copied the last deed.” You’re like, “Yeah, that’s for the treasurer to do. Now you switch it to a warranty deed or a special warranty deed, however you want to do it,” kind of thing. I’m like, “Oh.” It was really funny. That’s my only thing, Matt. Now, just make sure you don’t copy that much, which it sounds like you already know that. You’re just making your new … For California it’s probably a grant deed. Jill DeWit: That’s all you do. Don’t pretend to play treasurer. Steven Butala: No, I just don’t feel like we … I always feel like there’s more stuff we can do. We can do better at this, we can … I’m always looking in the future, trying to improve stuff. Steven Butala: Every once in a while, it’s like this treasurer deed thing. You don’t know that unless you just have a lot of experience, so it turns out we actually probably are qualified to talk about this stuff. Steven Butala: Mostly because we made all the mistakes for everybody already. Jill DeWit: You know, that’s what’s so funny. When we started on this whole thing and when we opened up our online community, I was worried that there was going to be questions that would stump us. Steven Butala: The area that I defer is the core legal stuff. There’s a lot of … Especially back east. Jill DeWit: Right, how should I structure my company, how should I do my taxes. Steven Butala: I know all that. Jill DeWit: I know that, but you don’t want to step on people’s toes. They may have a different view that they want to do or you just don’t want to weigh in. Is that why? Steven Butala: No, there’s some actual knowledge about buying and selling property, like let’s say in Pennsylvania. There’s some more in Canada. There are some legal issues that they actually really could make or break a deal, and I don’t know about it. I have to research it. Everything else is … We’re going to be okay. Jill DeWit: What things do you not want to answer legally? You alluded to that. Steven Butala: It’s not that I don’t want to answer it, I just don’t know the answer. And because it changes so much, it’s really just better to go find an expert online. There’s free advice for all that stuff everywhere. Steven Butala: But as far as building a land company or a house wholesaling company, no, I think you’re in the right place, listener. Steven Butala: Relationship advice? Not so much. Jill DeWit: Oh, boy. I can help. One of us can help. Just kidding. Steven Butala: Today’s topic? Taking land orders. You know, selling your land, online. Click a button versus taking an order on the phone. Hi. Hi, Jill. I’m interested in buying that property you have. Let’s talk for an hour. Steven Butala: You’re killing me. Jill DeWit: All that good stuff. Let me finish. Steven Butala: My heart hurts right now. You would have all the instructions on there, how it’s going to happen so they know what they’re doing, and they’re filling it all out and they know what to expect. Then, oh, by the way, they just click and check out. Nobody talks. All you know is you look at your bank statement and go, “Oh, look at that. Somebody bought that property. Oh, and it’s already marked sold on your web site, because it’s all hooked up to WooCommerce and all that good stuff.” That’s how you’re doing it. That’s what this is, which is beautiful. What’s so funny is, most people don’t get this. Why is that, Jack? Steven Butala: That’s what you want. Jill DeWit: Isn’t that awesome? Steven Butala: We’re not hawking anything here. Steven Butala: I’m not selling. I’m just you honestly. Jill DeWit: This is how you do it. Steven Butala: You want to set up a web site where you give them enough information and videos and really, really get the juices flowing. Big companies have spent billions of dollars. There’s a reason that there’s snacks and gum and stuff when you’re checking out in a grocery store line. You want to have that moment of, “Yeah, I could use a pack of gum.” “Oh, yeah, I could use 40 acres in northern Arizona.” Click, click, click. That’s what you’re going for. Jill DeWit: I like Amazon. Just think of your land business like Amazon. It could be. Can you imagine if Amazon didn’t have a click “Add to cart” or “One-stop checkout”? Steven Butala: If you had to call somebody? Jill DeWit: Could you imagine if I had to call Amazon? Steven Butala: Oh my god, and place an order? Jill DeWit: Right? Wouldn’t that be painful? Jill DeWit: That would be awful. Oh, wait, I also need, in addition to these Amazon Fresh items, I need staples and I need a new barbecue. Could you imagine what that would be like? Oh, wait, wait. Honey, is there anything else you want? Oh, she said napkins. Sorry, go back to the Amazon Fresh. Throw in some napkins. Steven Butala: She needs napkins. Jill DeWit: Yes. He’s looking down the inventory, and I’m telling him what I want and all that good stuff. It’s a work in progress right now, everybody, just so you know. It’ll be done here in a couple weeks. It’ll look great. Steven Butala: By the time this airs. Jill DeWit: It’ll be awesome. Anyway, I’m telling him what’s going on, and that there’s a house in there. Jack threw everything in there. What’s on there, by the way, is only a fraction of the properties, first of all, that are sold, and then even available. There’s more coming, and we’re just breathing new life into it and bringing it back. We’ve been doing it a different way. Anyway. Steven Butala: We’ve been concentrating on LandAcademy.com. Steven Butala: That’s the truth of it. Steven Butala: To the point where our kids are getting bad grades and everything, we spend so much time. Jill DeWit: I know. Anyway, there’s all these land properties and there’s one house in there, right? It’s so funny, because this guy goes, “Yeah, like someone’s going to check out and put a house for $300,000 on a credit card.” He’s thinking I’m nuts. I’m like, “No, no, no. Hold on a moment. They can do that. They will put a down payment on a house right there on a credit card, and that’ll start the whole escrow process and everything.” I’m sure he’s like, “What?” He thought I was being funny, and I’m not. So many people cannot wrap their head around this concept. Steven Butala: I’ve been dealing with this since 1995. Jill DeWit: Yeah, that too. Jill DeWit: Just the whole credit card thing. Steven Butala: Yeah, all that. That’s why we started Land Academy, because we got tired of answering these questions. Really, it’s true. 40 acres is $8,000 if you want it. The whole thing. Jill DeWit: Go buy it. Go stand on it if you want, if it’s still available. I’m retraining the staff to tell them, “Hey, go look at LandStay.com and tell people to go look at LandStay.com, because the minute someone checks out, it’ll mark sold.” If it’s not showing sold, and they’re halfway driving to the property, that means it’s available. If they really want to stand on it, they can. That’s a whole goal here. You want people to go to your web site, have it all easy, know what it is, and then sleep on it, maybe if they want to go drive there, stand on it. You don’t want them to call you. You want everything spelled out perfectly on there, and then when they go, “Baby, I’m buying it. You like it? Yeah, okay, good.” Then they check out and that’s it. You don’t know it took three weeks or three days or three hours for them to decide. Steven Butala: It turns out we’re not the first people to come up with this idea. Steven Butala: Jill and I, last week, went to In-N-Out Burger, or you could use McDonald’s. You can do any fast food situation. I’m not advocating that kind of food at all, but this is what happened. We stood in a short line. We placed our order. We looked up at a menu. There was no paper or anything like that. We can choose one through four. That’s what you can get. We said, told the guy, “We want two number threes, and one of them with cheese,” and that was it. He handed us some stuff, ran our credit card, which you don’t have to sign anymore because it’s such a small amount. We got our own drinks, we got our own drink refills, and when our number was called we actually went up on the board and we ate our own stuff, we cleaned our own table and we turned our tray back in. We did all the work. All of it. That’s what they want. It’s very, very efficient. If you look around in just about every business model, you are serving yourself. Jill DeWit: That’s very true. Nowadays, you are. That’s very true. Those kind of things, yeah. Steven Butala: Why not in real estate? Jill DeWit: I think we’re doing everybody a favor, too. Steven Butala: I do, too. Jill DeWit: Let’s think about this. The right people. Let me back up. Especially for our customers. My number-one customer is a reseller. I am priced wholesale. I price it right. I’m not going to stake it out. I’m not going to make it pretty. I’m not going to figure out exactly all the nuances to the zoning and how long you can have an RV there and all that good stuff. I include all that information, but it’s there for a reseller to know what they’re buying and then to go and then they’re going to make it pretty. Maybe they’re going to put a cabin on there or pull in a mobile on there or something. I don’t know. That’s for them. That’s my dream customer, and my dream customer doesn’t want to talk to me either. They know what it is. Steven Butala: That’s the customer we want. I’ve found, over the years, and Jill will, I’m sure, agree with me, that if you talk to somebody more than three times on the phone about buying or selling a piece of real estate, on the acquisition side or the sale side, the deal’s probably not going to happen. There are people who, through talking, they are checking to see how they feel. They don’t know how they feel yet. Jill DeWit: I don’t think they even know what they want yet. Steven Butala: They’re going to talk their way through it. They don’t know. Jill DeWit: It’s like going somewhere, like, “I need a dress for a wedding.” That’s really how they’re walking in. Steven Butala: Oh, my god. Steven Butala: People call in and say that? Steven Butala: I haven’t taken a call like that since 2003. Jill DeWit: You know what? You’ll never sell anything, by the way. Steven Butala: Yeah, they don’t know. Jill DeWit: “How about this one in Arkansas?” “Oh, that’s a little too many trees. I’m not sure I can clear all that myself. That’s going to get expensive.” That’s what you’re going to have. They’re not a real person. Steven Butala: Man. That’s truly horrific. Jill DeWit: Then also, you get the callers, this is how awful dealing with the phone is. You also get the people that are like, “Okay, I want to put an RV there and actually I might have, on Thanksgiving, five RVs there, because I’m going to have my family come, and we want to ride motorcycles. Is that allowed?” Oh, gosh, no. Get them off the phone. Steven Butala: Does this really happen? Jill DeWit: Totally. I had a guy the other day, it was so funny. I answered the phone. It was so funny, because the guy was shocked when I explained to him that he needed to call the county. I’m not going to call the county. He’s asking about a gorgeous property priced at $999. Steven Butala: This is getting under your skin a little, isn’t it? Steven Butala: When you go to buy something, or you get a little twinge in the back of your head like, “I need a new fire extinguisher.” I really actually do need to replace the fire extinguisher on one of our boats. Steven Butala: My first reaction is not to call the Coast Guard or to call Amazon or call Walmart or West Marine and get their advice. Jill DeWit: West Marine’s a great example. West Marine versus Harbor Freight. Steven Butala: I don’t want someone’s verbal advice. I don’t want someone’s advice. I think a human being’s advice is going to be flawed. It’s going to take too long. What am I going to do? I’m going to go online. Jill DeWit: What size is the perfect size. Jill DeWit: Wouldn’t that be hilarious? Steven Butala: What the hell is wrong with somebody with a piece of real estate, which is an infinitely more important purchase and is going to call and talk to you about it? Steven Butala: It’s like talking to a car salesman about which model to buy. They’re just going to tell you what they make the most money on. Steven Butala: We’re way over our time. Steven Butala: I think we’ve made our point. Don’t even talk about wedding dresses, jeez. All right. You’ve done it again. Don’t do it. Jill DeWit: I didn’t even say … I said dress for a wedding, not a wedding dress. There’s a difference. Steven Butala: You’ve done it again. 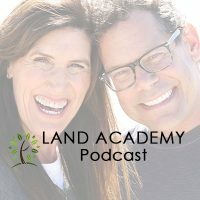 You spent another 25 minutes, actually, this time, listening to the Land Academy show. 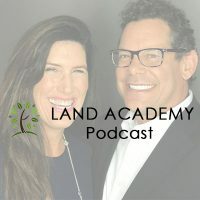 Join us tomorrow for another interesting episode called “The Sources of Investment Capital for Your Land Acquisitions.” This week is all about building up your land business correctly. Jill DeWit: Cool. And we answer your questions, posted on our online community, which can be found from LandAcademy.com, or go straight there. It’s LandInvestors.com. It’s free. Steven Butala: You are not alone in your real estate ambition. [inaudible 00:19:20] I did. Jill DeWit: That was weird. That went long. Steven Butala: It’s a joke. Jill DeWit: I didn’t feel like it was long. I know. Steven Butala: Talking. Talking on the … You know, this whole episode, I forgot to mention it, was based on a conversation or an exchange that member Luke Smith and I had. I asked him, “What’s the biggest challenge in your business?” This is a guy who sells, what? 20, 30 properties a week. Jill DeWit: Couple a day. Jill DeWit: Exactly. I understand. And it’s hard to train for that. Steven Butala: You know, back in the old days, before Jill, we didn’t even have a phone number. Jill DeWit: I know that. Jill DeWit: “Did I upload this correctly?” kind of thing. Steven Butala: I’m sure it happens. Do you know if it happens? You’re technically the CEO of that company. Jill DeWit: I don’t know if it happens. It’s a good question. Steven Butala: “Really, you can send off … Then how much should I offer?” I’m sure this happens. I hope it doesn’t. Jill DeWit: You know what? That does happen. Actually, and then it’s like, “You know what, let me get you with Land Academy.” That’s what they do. Steven Butala: That’s okay. That’s good. Jill DeWit: If someone really finds Offers to Owners, which happens, it’s true, all the time, and they are like, “What are you guys doing sending these offers to owners? What are you talking about?” They send them to the online community so they can get information and see what it’s about. Steven Butala: Oh, that’s brilliant. Okay, that’s the way to do that. Jill DeWit: That’s exactly what it is. Hey, share the fun by subscribing on iTunes or wherever you’re listening. While you’re at it, please rate us there. We are Steve and Jill.